Lung cancer is the second most common malignancy worldwide, despite the highly preventable nature. It accounts for more fatalities than colon, breast, and prostate cancers combined, as per the Centers for Disease Control and Prevention. Therefore, preclinical research tools, particularly xenotransplantation of tumor cells into immunodeficient mice, are essential for patients and could aid in assessing the effectiveness of drugs against lung cancer. The H1155 epithelial cell line was derived from a lymph node metastasis obtained from a 36-year-old Caucasian male patient with lung carcinoma before the treatment. A 2008 study by Wang et al. published in Cancer Research investigated the efficacy and mechanisms of the combination of gefitinib or erlotinib with OSU-03012, a celecoxib-derived antitumor agent, to overcome EGFR inhibitor resistance in the H1155 cell line. The article indicates that the OSU-03012/EGFR inhibitor combination induces apoptosis in H1155 cells, suggesting a link between drug sensitivity and basal phospho-Akt levels independently of EGFR expression status. Moreover, in vivo suppression of tumor growth was observed in the H1155 tumor xenograft model in immunocompromised mice. These findings demonstrate a new approach to overcome EGFR inhibitor resistance in non-small cell lung cancer, using the OSU-03012/EGFR inhibitor combination for the modulation of Akt and ER stress pathways. Lei et al. released an Oncotarget study (2017) investigating the effect of overexpressing erythropoietin (EPO) with its receptor (EPOR) and reported that in the H1155 xenograft non-small cell lung cancer (NSCLC) model EPO/EPOR overexpression is associated with increased growth and proliferation (via cell cycle promotion with Jak2/Stat5/cyclinD1) and siRNA interference with EPOR reversed this effect and prolonged survival. This signaling pathway was also demonstrated to mediate hypoxia induced growth; together data suggest blocking EPO/EPOR as a therapeutic strategy. A 2016 Oncotarget study by Chatterjee et al. used the H1155 model to demonstrate the use of a humanized antibody against the PD-L1 checkpoint ligand for imaging its expression. It is thought that PD-L1 expression may be a biomarker for the success of checkpoint blockade therapy. Results using near-infrared dye conjugated NIR-PD-Li-mAb MPDL3280A produced successful imaging in mouse xenografts, which has potential for clinical translation for optical imaging and personal medicine. On a similar note, the 2014 Oncotarget study by Azad et al. used the H1155 to demonstrate the use of an antibody against CXCR4 for molecular imaging and predictive therapeutic efficacy. The CXC chemokine receptor 4 (CXCR4) is overexpressed in tumors and contributes to tumor progression, growth and metastasis and so the group used a Zirconium-89 labeled monoclonal antibody (89Zr-CXCR4-mAB) that successfully detected expression levels of CXCR4 in mouse xenografts which has potential for selecting for patients that would best respond to CXCR4 inhibition therapy. The H1155 cell line (human lung) is used to create the CDX (Cell Line Derived Xenograft) H1155 xenograft mouse model. 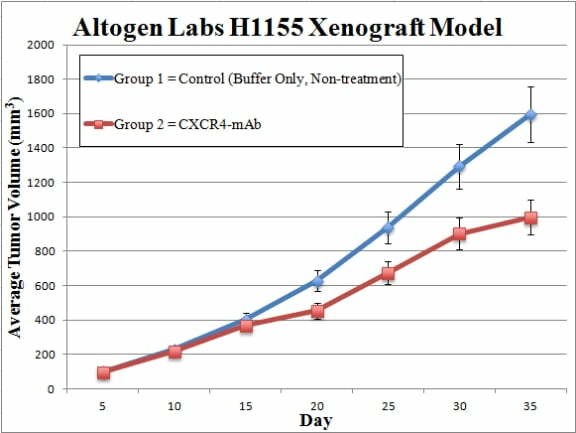 The H1155 xenograft model enables efficacy studies for acquired or preexisting EGFR-inhibitor resistance. 1. Cell growth is maintained at conditions of exponential growth prior to injection. H1155 cells are collected by trypsinization, and then cell viability is determined using a trypan blue exclusion test, with a minimum of 98% cell viability required. The cell suspension is then adjusted prior to inoculation. 2. NOD/SCID or athymic BALB/C mice (11-12 weeks) receive a subcutaneous (s.c.) single injection in the flank of the hind leg containing 1 million cells (100 µL volume) of the Matrigel-H1155 cell suspension. 3. To determine tumor establishment, injection sites are palpated up to three times a week. When tumors are established, they are measured via digital calipers and monitored until they reach 50-150 mm3. 4. The mice are randomized into predetermined treatment cohorts, and the compound of interest is administered according to the study design treatment schedule. 5. All tumors are measured on a daily basis, with mouse weights recorded at least 3 times a week. 6. As tumor size reaches 2,000 mm3 (or the predetermined limit by approved IACUC protocol), animals are euthanized. 7. The tissue collection and necropsy are performed as defined in the termination of the experiment. 8. Tumor excision, weight and digital imaging data are documented. 9. A standard gross necropsy is performed and designated tissues are collected. 10. Altogen Labs can snap freeze the tumors/tissues, submerse in RNAlater reagent, prepare for histology or isolate nucleic acid for genetic analysis. Animal handling and maintenance at the Altogen Labs facility is IACUC-regulated and GLP-compliant. Following acclimatization to the vivarium environment, mice are sorted according to body mass. The animals are examined daily for tumor appearance and clinical signs. We provide detailed experimental procedures, health reports and data (all-inclusive report is provided to the client that includes methods, results, discussion and raw data along with statistical analysis). Additional services available include collection of tissue, histology, isolation of total protein or RNA and analysis of gene expression. Our animal facilities have the flexibility to use specialized food or water systems for inducible gene expression systems.